While not a fan of musicals, I have been anxiously awaiting the release of Les Miserables on Blu Ray ever since falling in love with the film in theaters. For weeks the music, characters, and drama stayed glued to a sentimental part of my mind. When the Blu-ray finally arrived, I wasted no time ripping it open and exploring. Other than lacking the movie theater experience of big screen big sound, watching the movie at home was just as great, if not better (for the ability to cry in private). For those who may not be familiar with Les Miserables, the story follows the conflicted Jean Valjean (Hugh Jackman) through a dark and tumultuous period of French history. He seeks to redeem himself from a troubled past by raising Cosette (Isabelle Allen/Amanda Seyfried), the daughter of the late Fantine (Anne Hathaway). Valjean is never able to rest as he is constantly being hunted down by police captain, Javert (Russell Crowe). The Blu-ray package itself is very basic. The movie looks great and sounds great at home. Feature commentary with Director Tom Hooper was an intriguing feature that really made you appreciate the finished work to a greater extent. Hooper shares his thoughts in the decision making process when producing the film. The bonus features disc includes several other features that were very interesting, yet disappointingly brief. One of the features, "The Stars of Les Miserables", shows us behind the scenes looks of the phenomenal cast and just how meaningful taking part in this project has been to them. "Creating the Perfect Paris" was a brilliant segment which showed all the creativity and labor that went into constructing a credible and breathtaking 19th-century France. Once again, this was a great feature that unfortunately seemed too cut short. Fans of the original work will be happy to see that the included in the Blu Ray is a respectful nod to the author of Les Miserables, Victor Hugo. Other exclusives on the Blu-ray seek to highlight the groundbreaking feats undertaken in this film. A special look is taken at how Hooper directed the first musical to ever be sung live on film. Seeing how challenging a process such as this was only added appreciation and admiration to the finished product. Even an exclusive look into one of the few battle scenes in the movie proved to be different. Tom Hooper's continuous filming from multiple angles during action sequences provides for a realistic, seamless, and un-rehearsed looking conflict. At the end of the day, Les Miserables will go down as one of the best movies of 2012, and one of the greatest musicals of all time. While it felt that the Blu-ray was incomplete and that so much more could've been done with it, the brilliance of the movie itself still steals the show and makes this a worthy purchase. I believe it's safe to assume most people agree, considering the Les Miserables shelves at Wal-Mart were completely bare last week. 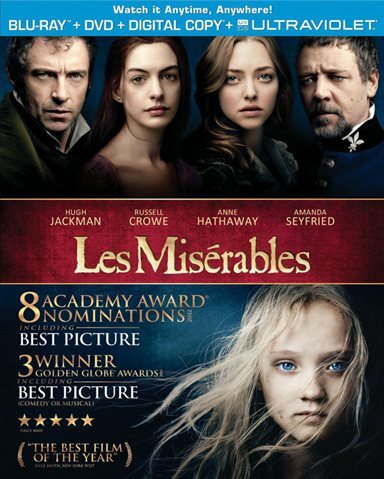 Download Les Miserables from the iTunes Store in Digial HD. For more information about Les Miserables visit the FlickDirect Movie Database.